Five Under 35 is a series of chats with young professionals in the industry who take food as seriously as us. Binge talks to both the person on the job, and the one behind it. This month: chef Anahita Dhondy. She's a fierce feminist, and has definitely learnt to allow no nonsense in her kitchen. "You can’t be girly and ladylike. It is a male dominated industry; you have to train your mind to be stronger," Dhondy says, speaking of her training and how being a young woman in the restaurant industry can be quite a struggle. She was only 23 when she joined SodaBottleOpenerWala as the Chef Manager. "I was fighting it out. I was being an authoritarian," she elaborates. "People thought that I was going to be the face of the restaurant, that I’d talk to the guests and that I didn’t know anything about cooking." It was when she started to get her hands dirty in the kitchen, and teaching her staff alongside, that they realised they couldn't afford to push their boss away. "So many girls get sucked into this, and they quit the industry. The only way you can stick around is by fighting it," Dhondy adds with conviction. Studied at: I went to school in Delhi at Springdales, Dhaula Kuan, and then went on to do Hotel Management. I had a couple of options but I chose the best one: IHM, Aurangabad. They have a specialised culinary course, so it’s not only Hotel Management, I get a BA Honours degree in Culinary Arts. I topped my college, and after that, got a job with Taj. I worked with them for a year and then went to Le Cordon Bleu, London. I did my Grand Diploma, which is like a Masters in the culinary world. It’s almost like finishing school: they teach you a lot of different techniques. It was all French. In India, I learnt a lot of cuisines and over there, I mastered in French cuisine and pastry. When I came back, I was looking for a job that would let me explore that. But I chose Parsi food because it was my calling. I wouldn’t say Delhi, I would say India. The most difficult thing I faced was that I didn’t get to work with many female chefs and didn’t get their opinion. It all depends on how much you can take and give back. You can't just keep listening; that’s not how it works. You have to raise your voice. If something's not right, it’s not right. It’s supposed to be equal for men and women. I don’t like women who say “I can’t do this because I’m a girl". You’ve entered an industry. Make sure you work around it, don’t discriminate and make it sexist for yourself. It already is sexist. There are multiple challenges. I feel like I was thrown into the deep end of the pool, with only a year’s experience. I learnt a lot of things on the job at SodaBottle, especially about how to handle people. Man management is something that textbooks can't teach you. It was extremely hard in the beginning. There were rough, teary days. People push you to the point where you begin to wonder if you actually want to work with them. When we were in Aurangabad, we had a class of ten girls and 50 boys. In London, we had about 25 girls and 25 boys, and the girls were far superior than the boys. They were better at multitasking. They are so even in India, but more girls have to take that plunge and believe in themselves, and believe that they can combat things happening in their daily lives. If you hear something, give it back. Don’t listen to sexist remarks. If you’re bending over and someone’s staring at your arse, look at them and say, “what the heck, you also have a mother and a wife”. You have to educate these people. They’ve grown up a certain way, where they treat women really badly. At first, they couldn't even believe that I could be their boss. One chef who’s doing well at the moment: There are quite a few: chef Sujan Sarkar, chef Sabyasachi Gorai. They’re doing really well; they’re also my mentors. 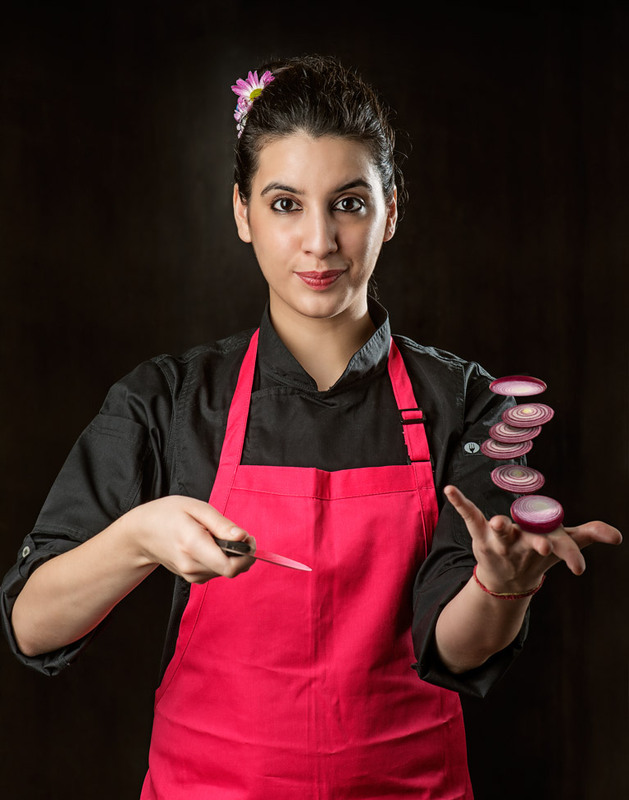 As for the young chefs, Chef Megha Kohli. She’s a dear friend of mine. People always ask me about the competition between us because we're both girls. Why does it have to be a competition? We can work together and actually build something for future chefs to come. Don’t treat it as competition; be a team. One food trend that’s going to stick around: Regional cuisine, seasonal produce, chefs focusing on healthier menus, more guest-and-chef interactions, and farmer interaction as well. It’s like the farm-to-fork concept. It's already been done a lot in the West: it’s a way of life. The chef interacts with the farmer, he knows what’s growing in what season, and plans menus accordingly. In India, that chain has not yet built up, and that’s something we're working on as chefs. Did being Parsi affect your decision about joining SodaBottle? I love cooking French food; I think it’s pretty. When you’re in London and you miss your family, you think “Are you sure this is your calling?” And when I came back to India, I heard of the SodaBottleOpenerwala concept by Mr AD Singh and chef Sabyasachi. I met him and he was really happy. I had said that I know French cuisine, but I don’t know Parsi food. He said, "You’ve grown up eating it and you’ve cooked at home". He asked me to make a few dishes and I cooked for him. And he told me that he thought this was my calling. He asked me if I wanted to join the team and be the Chef Manager. I took the decision overnight. Cooking philosophy: My cooking philosophy is that ultimately the dish must be really tasty. Flavour comes first for me; presentation is key, but flavour trumps everything. For me, a dish should be flavourful, and something that might remind me of something else. Or remind you of something, or it might create a memory in itself. You’d relate the food with where you ate it and want to return to it. Favourite food: I really like Oriental food, and really enjoy it when I go out. But when I’m at home, I prefer home food. You end up eating so much oily food outside, that you just want your simple daal, roti, sabji for lunch. No fancy stuff. When I go out I like to eat salads or dimsum with a glass of wine, just to relax sometimes. Favourite drink: I enjoy drinking beer but I think I’m a whiskey girl, in a man’s world. Favourite restaurant in Delhi: I can’t choose one but I really love Guppy. They do some insane pork belly, which I’ve eaten all over the world but I still love theirs. They have an amazing mushroom udon and their brunch is really good. Favourite restaurant across the world: Recently, I ate at Dinner by Heston in London. I really enjoyed the Tipsy Cake and the Meat Fruit, so currently that’s my top. But it keeps changing. I ate at Jaan in Singapore, which is really amazing. A couple of smaller places too, which are not really fine dining. But these two are the first two for me for fine dining. Likes to binge on: Chips and dip, and barbecued sausages. When you go back home and watch a movie, you want a nice snack. So it's either Uncle Chips or Magic Masala—whatever we get locally, nothing fancy—with a dip made at home.